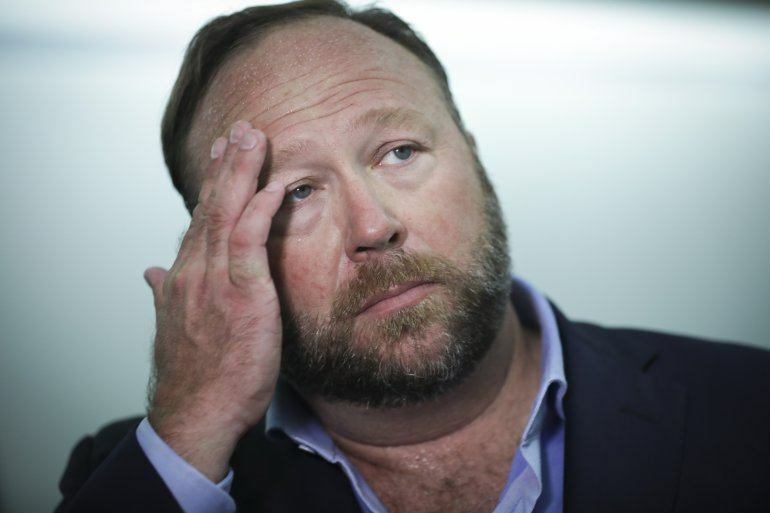 The Austin American-Statesman reports Jones described his conspiracy thinking as a kind of mental disorder during a deposition taken earlier this month for a lawsuit filed against him by the parents of a 6-year-old who was among the 20 children and six adults killed in the Newtown attack. During the March 14 deposition in Austin, Jones said he “almost had like a form of psychosis” where he thought events were staged. whether it’s intentional or whether it’s a mistake, there’s consequences for that, right? People should be accountable for the people they hurt? BARNES: Objection as to form. Well, sometimes people claim they’ve been hurt when they haven’t been. So you have to look at the agenda behind things. You have to balance things about why has the mainstream media lied so much, why our Government’s lied so much, the fact that the public doesn’t believe what they’re told anymore, and are we going to criminalize questioning Jussie Smollett or WMDs or babies in incubators. And it really is the fact that we’ve allowed the Government and institutions to become so corrupt that people have lost any compass of what’s real. And I, myself, have almost had like a form of psychosis back in the past where I basically thought everything was staged, even though I’m now learning a lot of times things aren’t staged. So I think as a pundit, someone giving an opinion, that, you know, my opinions have been wrong; but they were never wrong consciously to hurt people. And so I think it’s part of that process of me growing up in Rockwall, Texas and watching the police deal drugs and then conduct anti-drug programs in the school, I think that shook my opinion of police in general. And I was very anti-law enforcement until I grew up and learned more things, and now I’m pretty much pro police. So it’s been a process. (BY MR. BANKSTON) You said false things about Sandy Hook because it was psychosis? BARNES: Objection as to the form. Well, I’m just saying that the trauma of the media and the corporations lying so much, then everything begins — you don’t trust anything anymore, kind of like a child whose parents lie to them over and over again, well, pretty soon they don’t know what reality is. So long before these lawsuits I said that in the past I thought everything was a conspiracy and I would kind of get into that mass group think of the communities that were out there saying that. And so now I see that it’s more in the middle. All right? So that’s where I stand. (BY MR. BANKSTON) And I’m little concerned about something I heard in your answer, that it seemed to be you suggesting that you weren’t sure if these parents have suffered pain from what you did. Well, I was stating that I was reporting on the general questioning when others were questioning. And, you know, it’s painful that we have to question big public events. I think that’s an essential part of the First Amendment in America. And I do not take responsibility for the entire train of things that lawyers and the media have said I’ve done. So I do not take the responsibility. I do not take your indictment or your presumed conviction of me as the villain or the star of Homeland because that’s not who I am. And so I reject it. (BY MR. BANKSTON) Mr. Jones, are you finally prepared to admit that you have, indeed, caused these families a substantial amount of pain? Are you prepared to admit that? I am not prepared to sign on to whatever you and the mainstream media make up about me. MR. BANKSTON: All right, Mr. Jones That will have to be it. I will see you next time.